Like Christi, this student does not use his disability as an excuse, was typed on one of the recommendation letters. While I could never profess to understand the struggles that Christi endured, as a person living with a disorder, I think I know what it is like to adapt and overcome. A student reported that she is paying for college entirely on her own so this scholarship will really help as there are financial worries about not being able to finish. I’d like to thank the Thomas family for creating this scholarship. It’s amazing how they have turned such a horrendous tragedy into something beneficial for others. And the sweet Jennifer wrote: In the years I knew Christi, she taught me absolutely everything about life – embrace it, live it to the fullest, love with all your have. I only dream that I will be able to touch someone’s life the way Christi has mine and I feel that my career choice (nursing) will help me do that. If it weren’t for Christi and her battle I don’t know if I would have found this passion as soon as I did, or even at all. I really owe so much to her and she will forever be my inspiration. 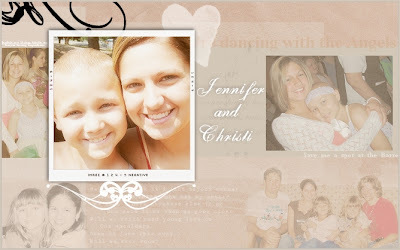 The majority of the colleges and pretty pictures I've been so blessed to share on the blog have come about as a result of Jennifer's Prayer Site she set up for Christi. I love those pictures and will forever be grateful for Jennifer loving our family. Last Sunday afternoon, four students from Fremont St. Joe Catholic High School were informed via email that they had received a Christi Thomas Memorial Scholarship to assist with their studies in the fall. By Thursday, we had received thank you notes from all four students - very impressive! I know I am hundreds of thank you notes behind myself so it was incredibly sweet and most surprising to read of their appreciation. One wrote, "You picked a most deserving recipient for the $1,000 scholarship. 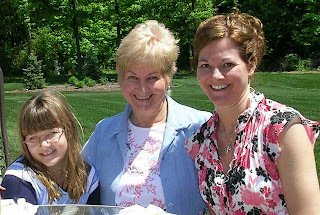 Christi touched Jennifer's life and therefore as a result of Jennifer's work, all of our lives were touched here at St. Joe as we prayed for and followed Christi's journey." Congratulations to Jennifer who will be a fabulous pediatric nurse one day on receiving the $1,000 Christi Thomas Memorial Scholarship. And congratulations on receiving $250.00 book scholarships to Brian, John and Megan! Best wishes to you all! Chris: He will be majoring in agriculture and had outstanding letters of recommendation: "He is quick to take charge and lead without being asked. He works well with others and takes them aside to help. He has unquestionable moral character and he converses very well with people of all ages." After the voting was done Shayne said, "Chris didn't play the card he could have." 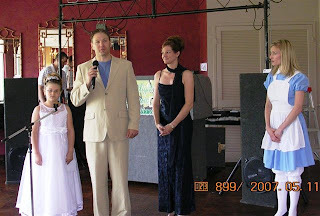 (His little sister was one of Christi's best friends.) We decided that was Chris; he'd get this on his own merit. What a great guy! MarLana: This sweet young lady has donated her hair to Locks of Love and was a S.E. cheerleader for six years, serving as Varsity Co-Captain. 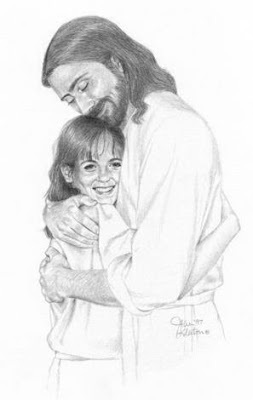 She wrote, "A quality I possess that Christi had as well is my love for others. I enjoy being around people and helping them in any way I can. I also love animals, especially cats, just like Christi. I believe in putting others before myself and always treat people how I want to be treated." During this summer, MarLana takes care of a boy with cerebral palsy. She has helped with Angel Ministries with their food drives. Best wishes to MarLana as she's off to study to be a Spanish teacher. Amanda: Her recommendations state that she: "is a conscientious student, focused and drive. She balances her high school work with post-secondary classes (taking college classes too) with playing sports - even earning state honors, all the while ranking in the highest of her class." This unique and delightful young woman, popular with her peers, she was elected Homecoming Queen! 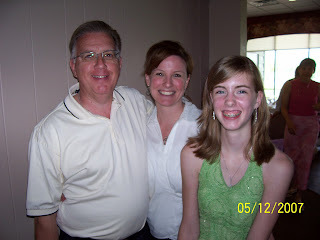 Amanda is also a Sunday School teacher and desires to obtain a teaching degree. She wrote: My ability to get up each morning and go off to school is a blessing from God and Christi's story reminds me of that. I am inspired by her strength as well as her dedication and commitment to others. Christi Thomas, although much younger than myself, is a true inspiration and hero to many, especially me." Lindsay: Lindsay's supporter wrote, "Lindsay is smart, well spoken, organized and motivated. She works hard, whether at her studies or dance - which is a passion or hers. She is mature, responsible and gregarious." 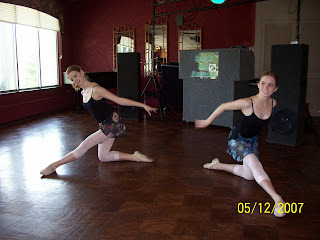 Lindsay has worked at Dance Unlimited for six years as a teacher and as an assistant. 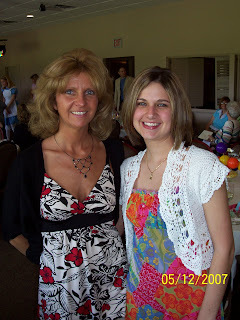 Christi enjoyed receiving Lindsay's attention and help during the many classes with Lindsay. Last summer, she was a Page in the U.S. House of Representatives. She will will study international studies and political science, in addition to taking pre-law courses this fall at a major state univeristy. We wish this drive Seneca East Senior, the very best!! Best Wishes to these very special tigers - and to all of the Seneca East Graduates!! Congratulations!! Be safe!! As we walked up, I was thinking about the fact that John told Shayne Penelope was being buried in New York today and also that Christi died at 9AM. Suddenly, tears formed and I choked. I started the little speech and my tears fell. I looked up at Shayne with my, "I didn't think this was going to happen look," and I felt Shayla's little hand pat my back when I got myself together. At this very time, eight months and two days ago, our beloved daughter - Christi Thomas, died in a Philadelphia hospital after a four year battle with cancer. She was in the fifth grade at Republic Elementary School. Days before her death, we established the Christi Thomas Memorial Fund in a concerted effort to memorialize her all too short life. One of the ways we wanted to keep her memory alive, was by offering a $1,000 scholarship to a Seneca East student each year because Christi loved this school district so very, very much. Even though through four years of continuous treatment, she was not able to attend school all of the time, she was always interesting in learning and always had a stack of books - wherever she was. The Scholarship Committee, consisting of five individuals, determined this year’s recipient based upon letters of recommendation, an application and an essay. 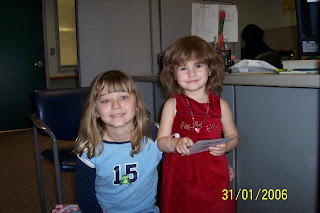 In addition, to represent Christi's love of books and reading we added a $250.00 book scholarship to help others, who like Christi, embrace a love of learning. The $250 scholarships, which we hope will take care of each of your textbook bill this fall, include: Chris, Marlana, Lindsay and Amanda . SHAYLA ANNOUNCED: The $1,000 Christi Thomas Scholarship is awarded to Alison. I'll write a little bit more about this amazing honors student soon. Congratulations, Alison - recipient of the $1,000 Christi Thomas Memorial Scholarship! To celebrate Christi's love of reading, these sweet students were each awarded with a $250.00 book scholarships to help them with their college textbook bill in the fall! So hard to believe eighth months ago today Christi died while I was helpless, just sitting beside her in her hospital bed, holding her hand and telling her how very loved and special she was. What I wouldn't do to bring her back to my arms! Last night Shayla and I chaperoned the junior high school dance. My sweet, sweet students were so very kind inviting Shayla to dance with them and spending their precious peer time chatting with her too. I was so touched. God's people are good. It's hard to believe we only have five days left of school. While I'm not going to miss all of the paperwork, I am going to miss those great kids I'm so blessed to call my students! Throughout the night however, I kept wondering why Christi couldn't have been healthy like the kids dancing the night away and my mind kept thinking of sweet Penelope, dying in New York. Her father called me yesterday after school and we chatted (or should I say cried our eyes out) for half an hour. We're very thankful that we are not the only two people on the Christi Thomas Scholarship Committee. We knew we'd be bias, so we have three others serving on the committee to make the decision regardng the Christi Thomas Scholarship for a Senior from Seneca East. The applicants are all fantastic! Many prayers have been said asking for help and guidance in making the right decision. We will be presenting this scholarship on Monday morning at the high school on behalf of the generous donors to the Christi Thomas Memorial Fund, kindly allowing us to do something positive over something so tragic - THANK YOU! 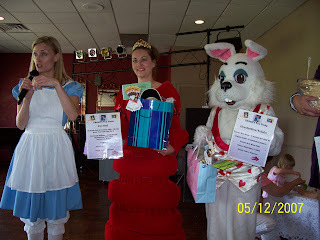 The Winner of the Grand Prize - even the new American Girl doll is dressed like Alice in Wonderland! Wow! Christi's "Chatty Cathy Club" friends - so sweet! On behalf of the Thomas team, Shayne says THANK YOU! 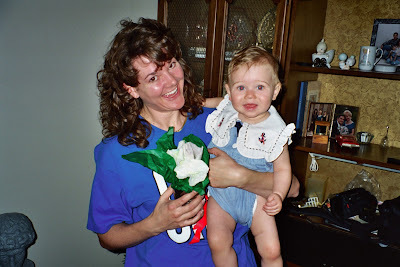 My First Mother's Day! (1998) Christi was born in 1997 the day after Mother's Day - Monday, May 12, 1997. Check out this oldie! Happy Mother's Day to my dear mom! 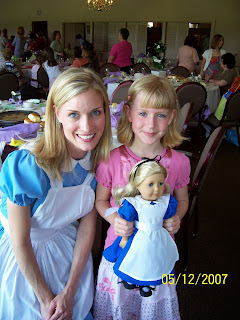 (Yes, she made the lovely blue velvet dresses my older sister and I are wearing!) I am so blessed!Isn't this old picture from the 1970s a riot?!! My father took it as we stood in front of the Christmas tree. I miss my dad so much! Those were the "good old days" - now Tina and I can joke, "I wonder how long we had to stand there smiling waiting for dad to focus that old camera?!!!" hee hee! We were trying really, really hard to forget that today was Mother’s Day. Shayne got us up well before sunrise (and when it was just 37 degrees, brrr). 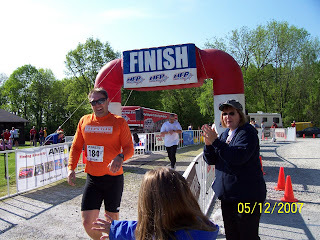 We loaded up the van and drove an hour to register him for his first duathalon in two years. (Exercise has been such a positive way for Shayne to cope. I’m so glad he’s back into his training and competitions.) 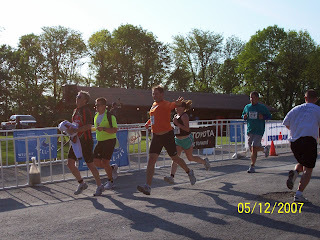 Aunt Marty & Uncle Jeff met us there and helped Shayla and I cheer Shayne on. Shayne did a fabulous job – his personal best record time, and he finished this run – bike – run (again) competition 124th out of 240 entrants. Yay, Shayne! I know of many others who have turned to terrible vices to “help” them cope so I’m very thankful that Shayne continues to take a healthy approach to stress. We then took lunch to my mother and Paw Paw Joe and visited with Shayne’s mom and grandma at dinner time. Both of our mothers gave us quite a scare. We had purchased Christi’s fingerprint charm for our mothers. Neither mom was able to find it after they opened the velvet pouch from the jewelry store. Our hearts fell as they were very expensive, but finally they found the charm deep down in the pocket. Whew! (It was just really odd that that same thing happened with both of our moms! I can't help but think Christi would have thought it was hilarious!) I think they loved the fingerprint charms and hopefully they’ll feel close to Christi when they wear them. I certainly do with mine! Shayne tells me I need to capture Shayla’s fingerprints in case anything bad happens to her too and I know he’s right so I’ll be doing that this week. Shayla is THE BIGGEST sweetheart! Very early this morning she had me unwrap her gift for me - a lovely flowering plant she grew at school. She planted it for me in the wee hours before we took off. Tonight, when I went up to read her bedtime story I found a song she wrote for me on my pillow - exactly what Christi would sometimes do. It was precious! On Saturday evening we were all three snuggled together in bed very early, due to exhaustion and knowing we had to get up so early. It was completely quiet for ten minutes or so. A little while later we heard Shayla say, "Christi would have really loved to have that cake today for her real birthday cake!" (Without a doubt, it was the most lovely cake I've ever seen! Thank you to Amanda W. and to the Tiffin Bake Shop! It was so impressive! In this picture, Alice, Shayne and Shayla help light the candles.) Then we talked about the lovely event for about an hour. I'm so grateful to have another child here on earth, and one as loving and compassionate as Miss Shayla! Thank you, dear Lord!In this picture, Shayla created a game for all of us to play. Tossing the ball and earning points was the first step. Go, Mommy!! Mother's Day! The words conjure a picture of a loving mother surrounded by her children and loving family, receiving flowers, gifts, and mushy cards from her progeny, celebrating the sacrifice and love of motherhood. This Mother's Day the above scenario will take place again, all over the country. It will be a wonderful day for so many, a chance to say Thank You Mom for always being there for me, for loving me even during times when I wasn't so lovable. As we go about our daily activities interacting with others, we'll hear the inevitable Happy Mother's Day greetings, from friends and even strangers, the cashier at the supermarket. This innocuous greeting, a kind pleasantry for many, is like a knife to the heart for the Other Mothers. Who are the Other Mothers? We are the ones who won't be celebrating this Mother's Day in sync with the rest of the country. We are the ones who people tend to shy away from, especially on holidays and most especially on this one day set aside to celebrate us! Who are we? We are the mothers of a deceased child. the morning, until we lay it down again at night, no matter what activity is going on around us, our minds and hearts are consumed with thoughts of our child who is no longer with us. So on this Mother's Day while everyone is celebrating the joys of motherhood, whether you're already a mother or about to become one, you may take a moment to ponder the Other Mothers. The Other Mothers who will be smiling on the outside while trying to quell the raging volcano of grief that is erupting on the inside as we fight with all of our being to prevent it from spewing forth and demoralizing everyone around us. We don't want that. We don’t want to deny other mothers their well-deserved day of recognition. We also do not want you to join our ranks. What we do want is to have our child acknowledged, and remembered. We want them remembered for the kind, caring, loving children that they were, not for the disease that ravaged their minds and bodies. This is for the mothers who have sat up all night with sick toddlers in their arms, wiping up barf laced with Oscar Mayer wieners and cherry Kool-Aid saying, "It's alright honey, Mommy's here." This is for the mothers who gave birth to babies they'll never see. And the mothers who took those babies and gave them homes. And for the mothers who lost their baby in that precious 9 months that they will never get to watch grow on earth but one day will be reunited with in Heaven! This is for all the mothers who go hungry, so their children can eat. For all the mothers who read "Goodnight, Moon" twice a night for a year. And then read it again. "Just one more time." This is for every mother whose head turns automatically when a little voice calls "Mom?" in a crowd, even though they know their own offspring are at home -- or even away at college. What makes a good Mother anyway? Is it patience? Compassion? Broad hips? The ability to nurse a baby, cook dinner, and sew a button on a shirt, all at the same time? Or is it in her heart? Is it the ache you feel when you watch your son or daughter disappear down the street, walking to school alone for the very first time? The jolt that takes you from sleep to dread, from bed to crib at 2 A.M. to put your hand on the back of a sleeping baby? The panic, years later, that comes again at 2 A.M. when you just want to hear their key in the door and know they are safe again in your home? Or the need to flee from wherever you are and hug your child when you hear news of a fire, a car accident, a child dying? We are deeply humbled and moved by the incredible outpouring of support and love we witnessed today. Our deepest thanks to "A Proper Party" to Jennifer and her darling mother, Lisa; to our sweet COSI friends for their amazing acting today in costumes, to the MANY businesses and people who generously donated time, talent and money to this cause and to the true Angels on earth for their attendance and financial support. Thank you, Kami - "A Proper Party" - event & wedding consultants launching their new business with this event today! Words cannot possibly express how highly we think of them and their work! Thank you, Kristin - "A Proper Party" - P. O. Box 475 Fremont, Ohio Thank you, sweet Jennifer and Lisa! Yesterday, Jennifer and her friend released pink balloons from Christi's gravesite. And I understand Christi's friend Cami and her mother left ten balloons out at the cemetery. I just couldn't bring myself to going out there today, but I will soon. THANK YOU thoughtful friends! Once in our home this afternoon Shayne said, "What did we do to deserve that?" I know we did nothing, but sweet Jennifer was definitely "touched by an angel" and we thank her for putting us in contact with her friends and with Wal-Mart and for getting all of this started! Congrats, sweet Jennifer on finishing your first year of college! We're so proud of you! Thank you for blessing our lives so richly! I'm still dazed by the magic of it all and would like to thank everyone from the bottom of our hearts. I was choked up much of the afternoon and I don't feel well about how I wasn't really able to talk with many people as I thought I would; it was just so hard. Today I met loving angels on earth for the very first time, and others I had not seen for a long time. Seeing Christi's friend and their mothers almost always makes me burst into tears on a regular day, not to mention today and I was so touched that they attended - it was the greatest thing, yet so bittersweet for me knowing how special they always made Christi feel and how I know she'd want to be with them too. It mus be so hard to understand this when you're so young (I can't make any sense of it at my age). 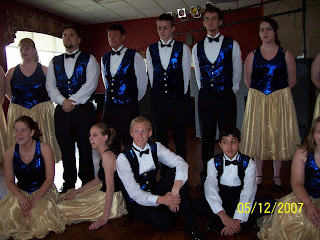 Watching some of my former students, now in high school - singing and dancing, moved me to tears as they sang a song from "The Lion King" - a song I'd heard Christi's little voice sing too. I was so proud of my students (and their parents) for giving up their afternoon to share their talents and perform for us. We are so blessed! Unfortunately, "blogger" isn't allowing me to upload any more pictures tonight! I'll share more in the future. Thank you for lifting us up and for making today a great celebration of life! With the wonderful, Dr. Cordero! The sweet Chatty Catchy Club girls called me Friday right after school to invite us to their party they were having for Christi's birthday. 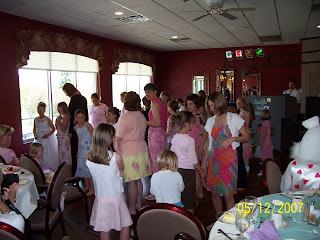 They wanted Shayla to come swimming with them but I had to decline - not that I didn't think Shayla would LOVE it, but because I knew I couldn't see all of those sweet, sweet girls – all gathered together in honor of Christi’s birthday. I was so moved. I told Julie that I just couldn’t bring myself to do it and she responded, “It’s a good thing you weren’t here a minute ago. They all stood around the pool and said what they missed most about Christi before they jumped into the pool.” Oh, that would have been hard. I hung up with tears rapidly flowing and dialed my sweet friend, thinking maybe one of the Grine’s would have time to take Shayla to the party. I thank the good Lord Lori did for me. I know she didn’t have the time, but somehow made it for us. On the way Shayla said, “Mom, I’m glad you’re still letting me go to the birthday party, even if you’re too sad to go.” She’s a sweetie! With our sweet COSI friends coming up to spend Friday night with us, Shayla determined everyone's sleeping arrangements on Thursday. She decided that she would sleep with "Elizabeth" in Christi's room. Well, that meant I needed to actually strip Christi's bed and wash all of her bedding for the very first time since August. I know that sounds terribly gross, but I just didn't want it washed and I dreaded having to one day do it and “move on”. (Denial is a much better state to be in than reality!) I would occasionally go into Christi’s room and try to catch her scent, even though I could no longer do so after eight months without her here. Early Friday morning I removed about 40, but who's counting, treasured stuffed animals neatly arranged from on top of her made bed and pulled off all of the bedding. With tears of self pity streaming down my face, I quickly started the washing machine trying to convince myself it was just a regular load of laundry. A small step during a terribly emotional time. We had a lovely evening with our dear friends who arrived from Columbus and we are so grateful that they love us and that they’re going to be the characters for today’s tea party. Jenn looked adorable last night out in the driveway sporting her “Queen of Hearts” skirt. (Shayla suggested which character would be most fitting for each person to play and they agreed.) It was a pleasure to also get to meet the sweet little niece of Traci’s last night too. Shayla had a grand time playing!! The scholarship applications, which are due today, started rolling in over the past few days. I guess busy students were just waiting until the last minute. Again, the Christi Thomas Scholarship Committee of five will have a hard time determining the next three scholarships for students from: Seneca East, Fremont St. Joe's and Dance Unlimited. 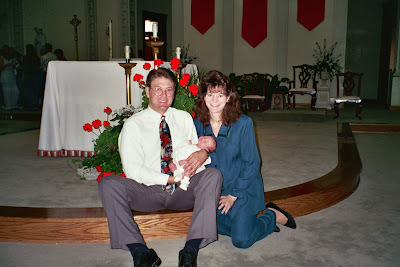 Six day old, Christi, after Mass at St. Mary's - the same church where her funeral was held. Forever My Baby You'll Be! (Christi, 1997)I have my two "sleeping baby" photos at the top of the stairs. I took this one to the funeral home and upon it's return Shayla said, "Mom, isn't that me?" I told her, "No, the other one is your sleeping baby picture." She said, "Oh. I always thought it was the other way around." We never talked about the baby pictures. Ever since then I keep wondering if Christi knew which baby picture was hers. Oh, I wish I could find out these things that died with her on that bleak September day. I was very touched to receive the following from a fellow NB mom. 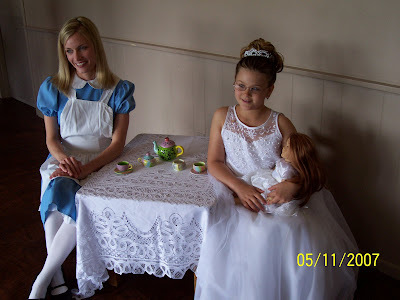 We're hopeful Eden will be back home and able to make Christi's Tea Party, but we know the cancer world so we'll just keep our fingers crossed that Princess Eden can indeed join us! Lisa lovingly wrote: Hi Thomas Team from Philly! We no more arrived and the present of Christi was apparent. Once we were settled in the RMH, Eden was hungry and wanted to run to McDonalds so as we were walking out we looked for a stroller for her and there were none to be found. As we headed for the door one of the Volunteers was walking our way with Christi’s Jogging stroller and asked if we would like to use it… I have seen it enough in pictures to know it was hers. I cried all the way to McDonalds. The next day Flashes of Hope showed up at Clinic to do pictures of Eden and asked if we knew Christi. 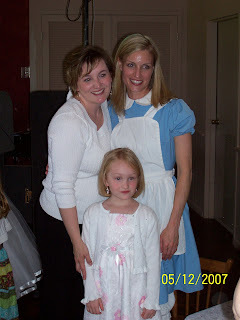 Later that day after we were settled into our room I went to the kitchen and ran into another parent who’s Child has Neuroblastoma and once she found out we were from OH she asked if we knew Christi. 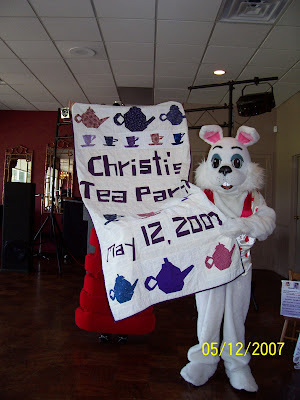 Please know that Christi’s memory lives strong here in Philly as well as in the hearts of all who knew her! After Christi died we went back to the Ronald House to pack up our room for the final time. We also donated Christi's big blue jogging stroller which served us well for all of Christi's treatment years. What was very symbolic was that it got a flat tire on that final trip to CHOP so we tried to explain to Ronald that it was a great stroller, but it needed the tire fixed and we often wondered if they ever fixed it or just threw it out. You can't imagine the comfort it gave me to read Lisa's email to know Christi's stroller is still helping other kids get around Philadelphia! Yahoo! Thank you, dear Lord! For months I had imagined going out to the cemetery on Christi's birthday and releasing balloons. Now I've come to realize even though I feel like I should do this and that she'd love that, I just cannot muster up the courage to do so. Each time I catch a glimpse of the date and see it's so close to May 12th - always a very special time for our family, I am moved by grief. 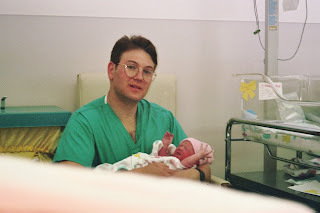 I vividly remember the very first time I held her in my arms in the recovery room following her birth and of course the last time I held her - after my plane landed in Philly and Tim safely drove us to the Ronald House. Even though her legs had been hurting all week and walking had been minimal, she burst through the gates outside of the Ronald House and jumped up right into my arms in her purple silky pajamas. I miss you so much, sweet Christi! Eric surprises Christi by showing up at her party at the movies!Wasn't it just a year ago today when we knew it might be her final birthday so we hired a limo to pick up her friends from school to wisk them off to the ceramic shop and then to the movies? Weren't the Cooks just here to celebrate her special day? It's the oddest feeling. Like I can actually reach out and put my finger on it, then it was like she suddenly went out like a light. Well, as one can note by the time, it's been a very difficult week for us. We're going to somehow get through the weekend - her birthday, mother's day - oh my. May God be with us. We're not doing so well on our own. Hate to sound so negative, but I really wish we could have our cake and eat it too! 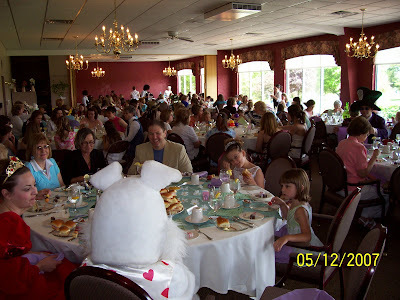 On a much brighter note, the tea party is SOLD OUT! Wow! Thank you so much for the incredible generosity. We hope everyone has a grand time - we think they will! Let them eat cake! Since my last update a few more items have been lovingly donated for the auction. Shayla's getting her little prayer around, but I think she should say, "Get off your wallet - this is a fundraiser" or "Don't make me scream and shout, turn your pockets inside out." OK, just joking! hee hee hee! Check out these incredible donations! Kristin, Kami, Jennifer, Lisa and many others have been working so hard. THANK YOU! I panic every time I learn of the date because I realize it is so close to May 12th - the birthday that won't happen, but this is really been an incredible help. So hard to believe it was just one year ago that she was horsing around at her incredible school birthday party our sweet friends, the Grines, created for her. Little did we know one four months later one of the same horses would be used at her funeral. 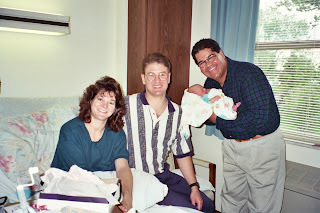 (1997) Our awesome priest, Father Joe, comes to the hospital and blesses the brand new baby, Christi! THANK YOU, Father Joe! 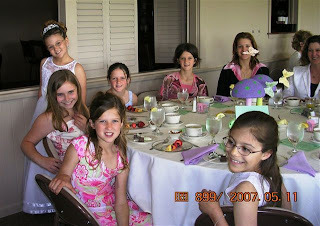 (2003 - Age 6) Yes, an incredible birthday breakfast with the Disney princesses in Cinderella's Castle! 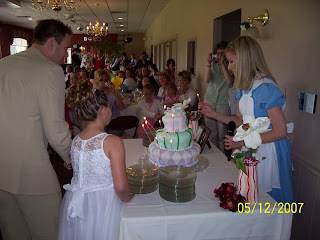 (2006 - age 9) Christi realizes Aunt Marty put a picture of Christi with her cat on her cake - wow! Shortly after is when we noticed that despite the fact we went on to eating our cake, Christi had her hands folded in prayer.